Ballinrobe Waste provides waste collection and recycling for all types of households. We have black and green wheelie bins available for hire and schedule regular collections to ensure waste doesn’t pile up. Visit our domestic waste collection page to learn more. We also facilitate waste collection and recycling for businesses throughout South Mayo and parts of Galway. Due to the nature of commercial waste, a skip may be required; in these cases we can deliver a roll-on/roll-off skip which is available to hire. Visit our commercial waste collection page to learn more. We have a comprehensive range of skips available to hire with sizes to suit all types of requirements available. Visit our skip hire page to learn more. 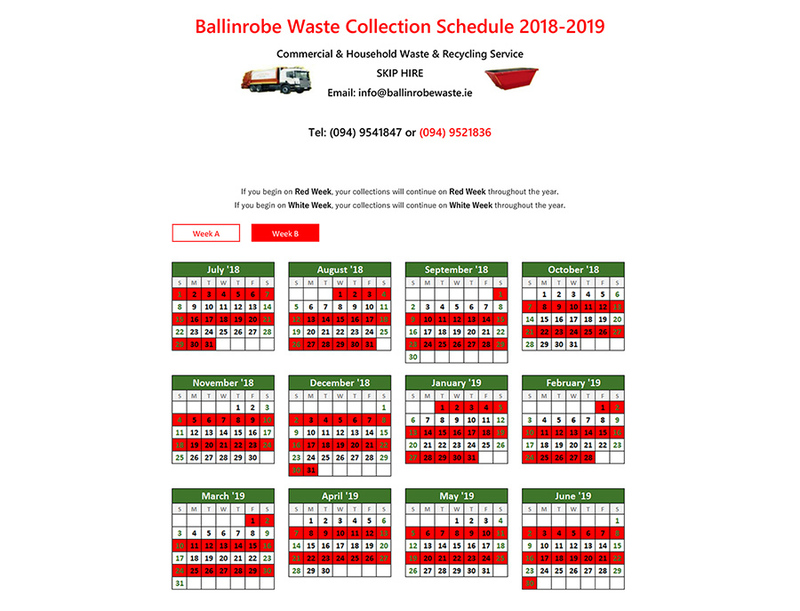 Established in 2000, Ballinrobe Waste has been delivering an efficient and reliable waste collection and recycling service to customers throughout South Mayo and parts of Galway for almost two decades. We facilitate waste collection and recycling for households as well as businesses and enjoy a positive working relationship with a diverse range of clientele throughout Mayo and Galway. If you have any questions regarding our waste collection or recycling services, don’t hesitate to get in contact with us. Our office hours are Monday to Friday 9am until 5pm and we are always happy to speak with our callers. We advise you print this off and keep a copy somewhere you can easily see it. For all collection dates, please see our calendar. Contact us now for all your waste collection and recycling requirements.